What's Due Back at the Library Today? Blog Post Level Five Thousand!!!!!!!!!!!! I didn't specifically plan to start reading a book every day this month, but (as I write this), I'm tracking at that level for the first time in about two years. Now, I'm not complaining, just surprised at my own actions -- as I so often am. I expect there will be a lot more short reviews below than the recent standard, but I've also learned not to make predictions or promises. Michael Goodwin & Dan E. Burr, Economix (2/4) -- Goodwin is a freelance writer who clearly was influenced by Larry Gonick at an early age; this book takes Gonick's approach to history and applies that (also organized historically) to the dismal science. Along the way, Goodwin (with expressive, data-packed art by Kings in Disguise artist Burr) shows a surprising amount of love for Adam Smith, though he comes down on a somewhat lefty, pro-economic-intervention viewpoint. (Of course, the pure laissez-faire types are either deeply stupid or mendacious, since no human system runs perfectly without any controls -- and Goodwin is good at making the necessary cases against those very self-centered folks.) Though, since Economix is organized historically, it will only be the very most Whiggish of readers who find anything at all to complain about before the last couple of chapters -- and so Goodwin sets his trap. Because if you agree with him about the causes of the problems of the Gilded Age and the Great Depression -- and, even more so, if you agree with him about the successful solutions to those problems -- then he's halfway to convincing you that our era, with very similar problems, should call for similar solutions. I should be clear: there is some axe-grinding here, but Goodwin does present the ideas of laissez-faire economists honestly and appropriately, and embeds those ideas into the fabric of their times, from Ricardo through to Friedman. In the end, Economix is about as detailed and funny and thoughtful a look at economics as anyone could have hoped for. Jacob Chabot, The Mighty Skullboy Army, Vol. 2 (2/5) -- Skullboy is a great comic creation -- a grade-school would-be world conqueror with, yes, a skull for a head and two main minions (a robot and a monkey) who are not nearly as competent as Skullboy hopes they would be. And Chabot's appealing clean, newspaper-comics-inspired lines makes their adventures (mostly misadventures) just as lovely as they are funny. (I saw the first volume of his adventures back in 2007, and everything I said then still applies.) This book collects Chabot's Skullboy minicomics from 2007 through 2011 -- in other words, from after the first book until there was enough for a second book. There are stories of mixed length here -- some quick strips and some longer adventures -- plus a few extras, like the slightly related "Renegade Cop," which has a lot of fun with exactly the cliches you expect it to. The cover is also not just fun in itself, but acts as something like a table of contents -- you can track every element to a particular story by the time the book is over. This is funny and smart and appropriate for even grade-school kids, and I hope ten years from now I can complain how the Skullboy TV show isn't as good as the comics were, even though millions of people love it. Roger Langridge, SNARKED!, Vol. 1: Forks and Hope (2/6) -- Langridge, who's been kicking around comics for a couple of decades doing interesting, quirky (and usually based on deeply old-fashioned and unusual media and styles) stuff like Fred the Clown and (more recently) a bunch of surprisingly excellent Muppet Show stories, decided to launch his own series, with characters and settings he could own himself. Of course, being Roger Langridge, he apparently couldn't do so simply, and so this is a fantasy-world version of various Lewis Carroll verses, mostly (so far) "The Walrus and the Carpenter" and "The Hunting of the Snark." This collection gathers the first five issues of the series, which is mostly scene-setting: we meet the rascally inventive Wilberforce J. Walrus and his compatriot, the easily-led carpenter Clyde McDunk, as well as the missing Red King's heirs, the feisty young Princess Scarlett and the toddling Prince Russell. It's not as convoluted or slapstick or silly as some of Langridge's other work -- it's swashbuckling, but so far pretty sunny, with that Victorian sense that the odds are completely stacked against Our Heroes, but that they will of necessity prevail in the end because their hearts are pure. (That's Scarlett and Russell, mind you -- Walrus and McDunk are as impure as it's possible to be in a book with an intended audience that can't get into PG-13 movies.) So far, it feels like a weak-tea version of Langridge to me, but I have to admit I'm no expert on his work. 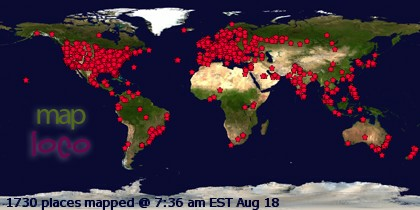 And it is still early days. But, so far, the art is lovely and the story is pleasant but no more. Jim Butcher, Cold Days (2/8) -- It's the fourteenth book in a long-running and extremely popular urban fantasy series, so anything I could say about it would be beside the point. (I've also spilled quite a bit of ink on Harry Dresden and his world over the past few years, with reviews of the novels Small Favor, Turn Coat, Changes, and Ghost Story and the collection Side Jobs.) The escalation of Dresden's power that's been going on the whole series continues, but Butcher has whole vistas of enemy power that he can reveal -- this book in particular sees Butcher's love for epic fantasy deeply influencing this series, with an artifact that could have George R.R. Martin cocking an eyebrow, among several other new big pieces of series furniture -- and the enemy will always vastly overmatch Harry Dresden, no matter how much power Harry ever gets. That's the whole point of Dresden: he's tough, cocky, plucky, and always the underdog. And, despite what some fans might think, these books are popcorn, and are filled with easy answers to hard questions, so the appropriate response to this one is: it's a hell of a ride, a wonderfully enjoyable pulp adventure. 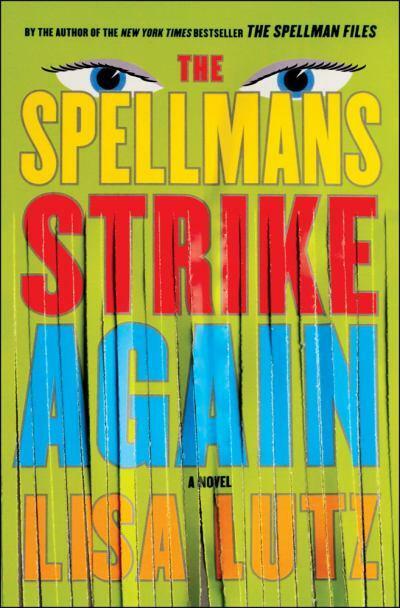 Lisa Lutz, The Spellmans Strike Again (2/14) -- The fourth book in the humorous mystery series (I read the first one in November and the next two last month) continues Izzy Spellman's long-delayed, and long-fought-against, maturation: she's 32 here, and almost ready for a normal adult relationship. Of course, the rest of her family is no better -- her parents somehow can stay together, though they don't deal with the rest of the world healthily at all -- especially her incredibly self-motivated younger sister Rae. In this book, Lutz continues to shake up the series -- I'm quite impressed how she doesn't allow any of the relationships or trigger points to stay stable from year to year, since they usually don't in real life. And, for a mystery, the series is still focused on what PIs really do: trace missing people, work for lawyers, try to dig up dirt on their competition. (Well, maybe not the last quite as much.) It's smart about people, it's funny, it's set in what feels like a real world, and there's an overall arc to the series -- that's already vastly better than what usually passes for a "humorous mystery" these days. I'm nearly caught up now, which is a shame -- particularly since I'm sure this is a series that can't run for decades; Lutz's story will go somewhere in particular and then end, as all stories must. 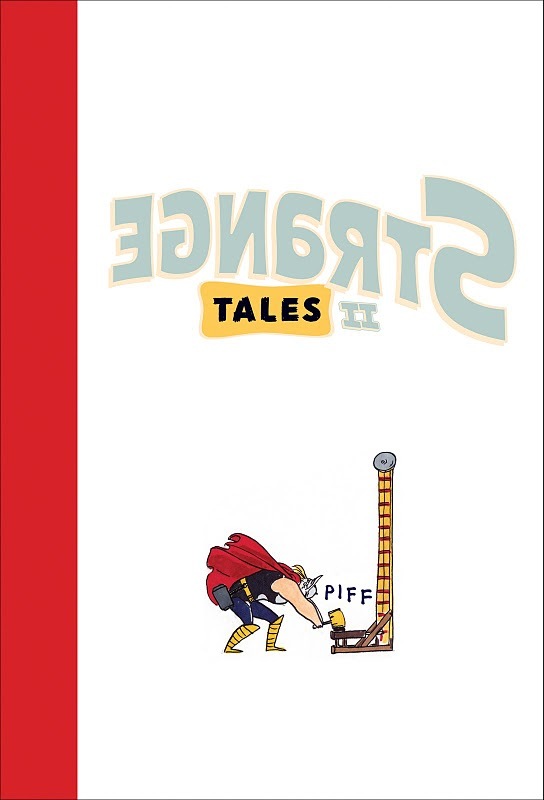 Jody Leheup, editor, Strange Tales II (2/15) -- Every successful genre story has a sequel, even if it isn't really a "story" to begin with, and so 2009's Strange Tales begat 2011's Strange Tales II, more stories of the Marvel superheroes by indy-comics writers and artists. See my review of the first collection (linked in the previous sentence) for details of the concept and execution; this one is pretty much just more of the same, by some of the same people and some new names (Harvey Pekar! Kate Beaton! Jeffrey Brown! Ivan Brunetti! Rafael Grampa! Nick Gurewitch! Shannon Wheeler! Jhonen Vasquez! Los Bros Hernandez! David Heatley! Terry Moore! Alex Robinson!). Only a few of the pieces are legitimately alternative -- rather than the kind of thing that could have fit into the intermittent Marvel-making-fun-of-itself comics like Not Brand Eccch or What The-?! -- like Tony Millionaire's vision of Thor running a cheap roller-coaster. In fact, a lot of these stories could actually be in-continuity: they're cutesy or "emotional" moments about the big franchise characters, who all act recognizably as their heroic, Universe 616 selves. In short, these tales aren't particularly Strange at all; they're just drawn in styles that the long-underwear crowd is less familiar with. Lucius Shepard, The Taborin Scale (2/25) -- This was one of Shepard's periodic stories about the malevolent, and nearly dead, dragon Griaule, who lies dominating a valley in a world only slightly removed from ours -- a novella published as a book in 2010 by Subterranean. (I see that there's a big collection of all of the Griaule stories now; I must get that.) Shepard was one of my favorite writers even back before I worked for the SFBC, but I haven't read as much of his work over the past decade -- I've been focused on novels, and he's mostly been publishing novellas-as-expensive-books -- and I lost all of my Shepard books in the flood of 2011. So perhaps it's time to start again with one of the speculative fiction's fields best writers, and this dark story of the influence of Griaule -- and you can take him as a metaphor for anything you wish, or for nothing at all -- is a sharp place to start. Jim Henson, Jerry Juhl, & Ramon K. Perez, Jim Henson's Tale of Sand (2/26) -- Henson, the puppeteer and impresario, wrote three drafts of a heavily stylized, symbolic screenplay with his writing partner and employee Jerry Juhl in the late '60s, but Tale of Sand never got made, pushed aside as Henson's Muppets generated more work and ideas and projects than even Henson could juggle. Forty years later, those screenplays were turned into a graphic novel by Perez, under the beady eye of Henson's family and corporate apparatus, which is an odd afterlife for what would have been an aggressively artsy, "difficult" movie. 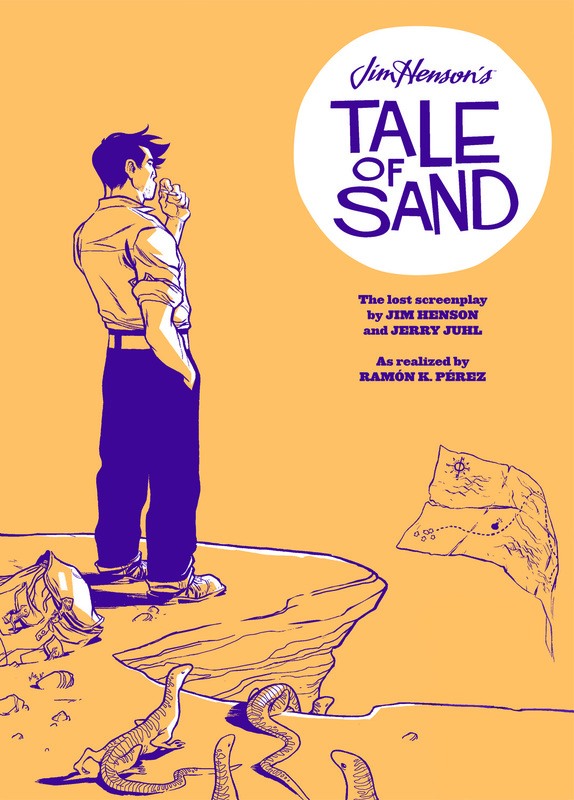 Tale of Sand is the story of an Everyman named Mac who is chased through a heavily symbolic series of adventures in the American Southwest by a frankly devilish figure, with minimal dialogue and what would have been maximal imagery. Perez creates the paper equivalent of a mind-expanding '60s story, and keeps it only mildly of its time, which is a serious achievement. (One major plot point centers on Mac trying to light his single cigarette for what would be a reel or two of the movie, for example.) This never was going to be a major piece of the Henson oevure, but it now has something like a finished form, and it's amusingly weird. It could have done much worse. Lisa Lutz, Trail of the Spellmans (2/27) -- The fifth and most recent in the humorous mystery series, which I've been reading for the past four months. Everything I've said before still applies: Izzy Spellman is an terribly engaging, realistically screwed-up narrator, and her family is worse -- though they're another couple of years older here, and continue to change in ways that neither match conventional sitcom plots (everything put back in the box at the end) or the endlessly-accumulating nice things of so many long-running series. This series is a template for not just how to write funny, entertaining stories, but how to do so honestly, and to do them as novels rather than just disposable entertainment. These books are something really special, and I'm sorry to realize that I'll have to wait another year or so for the next book from Lutz now.